This is your year! It’s time to earn that promotion, get your raise, or capture that leadership role you’ve always wanted. If you want to make big strides this year, you’ll want to make sure you shine in all the right ways. Remember, you never know when the right person will take notice of your abilities so it’s a good idea to always practice consistency—consistency in your attitude, work ethic, standards, and perspectives. Of course, you’ll want to get the basics right first. Complete your projects before the deadline, show up on time, strive to make positive connections. But, beyond that…how do you stand out while being yourself and not seeming desperate? Your opinions and ideas are worthy. When you speak up during team meetings or during one-on-ones, you start to be on others’ radars. This is a great first step to earn your next big thing. They say you shouldn’t judge a book by its cover, but guess what…everyone does. Dress well every day, as if your boss’ boss is going to step into the room and vet you for a promotion. Keep your standards high and don’t talk badly about others. Gossip has a way of circling around, and it’s just not worth it. Demonstrate that you are trustworthy and above petty office rumors. Doing everything like everyone else will never get you ahead in the workplace. Set yourself apart by taking smart risks. Bring your ideas forward, speak up, take on big responsibilities, be a leader. Of course, you’ll want to make sure you’re making strides before you make waves. How will you make an effort to stand out this year? Let me know in the comments or send me a message outlining your plan. This is YOUR year. Go get it. May 18, 2016 What is the difference between a BOSS and a LEADER? Both leaders and bosses give instructions, but unlike a boss, a leader helps to carry out the actual work. She pulls her weight, alongside the rest of her team. A good leader inspires others by demonstrating that she is invested in whatever project the team is working on. Since a leader is working alongside his team, he understands how everyone clicks and what strengths and weaknesses each team member possesses. This knowledge helps the leader assign appropriate tasks to individuals and helps him understand the specific work style of each person on the team. By showing a genuine interest in each team member and taking the time to get to know everyone, the leader can easily identify when people are either discontent or thriving. On the flipside, great leaders open themselves up to others. They practice transparency and, since they have nothing to hide, they don’t mind others getting to know their true, authentic selves. Instead of being reactive, a leader is proactive. The leader has an intimate knowledge of the work that is being undertaken and can therefore point the team in the right direction. That isn’t to say that the leader should micromanage to ensure that a task or project is done in a certain way. Rather, she should offer guidance and allow the team to figure out the details on their own. Instead of reprimanding or belittling the team, a leader builds his team up. By offering encouragement and constructive critiques, a good leader will develop a team that is inspired, motivated, and productive. Great leaders are humble enough to realize that they don’t know everything. They aspire to keep growing and changing; they move forward and take their team with them. When a roadblock gets in their way, great leaders don’t throw in the towel or turn around. Instead, they strategize with their team on how to overcome the obstacle and continue moving forward (or in a new direction). Do you feel like more of a boss or a leader? Take a few minutes to think about these five qualities of a great leader and consider how you can embrace your leadership. Need more guidance? Reach out and contact me today. 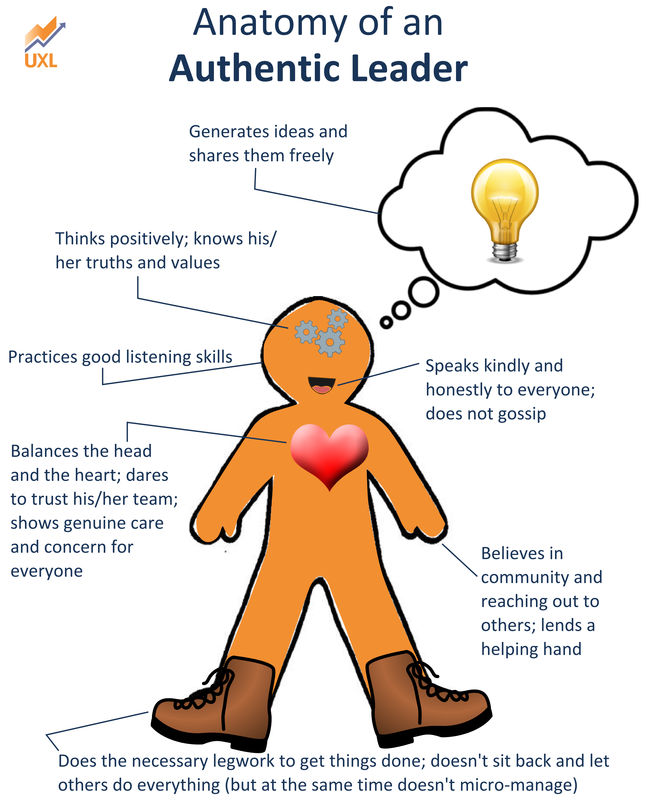 There are several components that make up an authentic leader. The model below shows some of the basic elements that are needed to create an excellent leader. It’s good to have a healthy amount of each of these qualities, although no one is perfect and one or two might slip from time to time. Study the model and ask yourself, “What am I doing well and what do I need to improve?” Make an action plan.